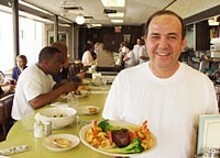 Formerly known as Giorgio, at Eddie’s you can get a grilled cheese sandwich or steak Diane. You can also order from the separate pasta menu. It looks like a retro lunch counter, but choose from the “Counterside Gourmet” section of the menu, and you might well be in a little Italian trattoria.